Having all students use in class the suite of digital technologies they use 24/7/365 so naturally as to be near invisible is critical to the on-going digital evolution of the school. As Lee and Levin elaborate in their freely available (http://douglasandbrown.com/publications/) BYOT and the Digital Evolution of Schooling until schools are willing to distribute their control of teaching, learning and personal technology, to trust, respect and empower their students there is little likelihood of the school normalising the use of the digital and furthering the school’s digital evolution. Rather the school, even if spending thousands on digital technologies, will remain operating within a paper based, control over operational paradigm unable replicate its client’s normalised use of the digital outside the school walls, and to meet both the client’s and society’s rising digital expectations. Schools have ultimately to trust and empower all their students. That is critical if they are to normalise the whole of school community use of the technology, and position the school culturally and technologically to continue its digital evolution. The point that Lee and Levins make in their book is that BYOT- which is where the school encourages the children to use in class the digital technologies they are already using 24/7/365 – is but a phase, albeit a critical phase, in the digital evolution of the school. 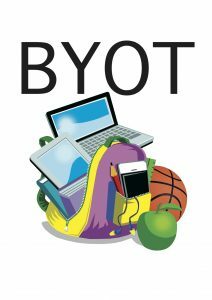 BYOT – contrary to the views expressed by many – is not primarily about the technology but rather is a vital educational development where the school declares its willingness to cede its unilateral control of teaching, learning and technology and to genuinely collaborate with its digitally connected families and to work with them in providing a mode schooling befitting a digital and networked society. It is a major step in creating a 24/7/364 mode of schooling that actively involves all the ‘teachers’ of the young – not simply the professionals in the school. When all the students use their own personal technologies naturally in the classroom a new norm is achieved, a norm where the technology recedes into the background and the learner and the desired education takes precedence. With normalisation BYOT as a label very soon disappears from the school’s vernacular. That said it bears reiterating that in 2017 relatively few schools globally have achieved digital normalisation – for the simple reason that it is very hard to do. As Lee and Levins (2016) address in depth, and this series of blogs affirms the readying of the school for BYOT and in turn digital normalisation requires astute leaders who over time are willing and able to address the plethora of variables needed to significantly change the culture and thinking of the school, and create an integrated digitally based ecosystem able to continually make best use of the digital. This entry was posted in 24/7/365 digital education, 24/7/365 schooling, BYOD, BYOT, digital evolution, Digital normalisation, digital schools, digitally connected families, Evolving school ecologies, school digital ecosystem, School evolution on March 27, 2017 by mallee.